“gorilla-repl” is a tool that lets you have notebook-style interface in a web browser, instead of linear command line interface in terminal. Just run the lein install shell script. now, press 【Shift+Enter】 to evaluate the current cell. now, you can start to type Clojure expressions. 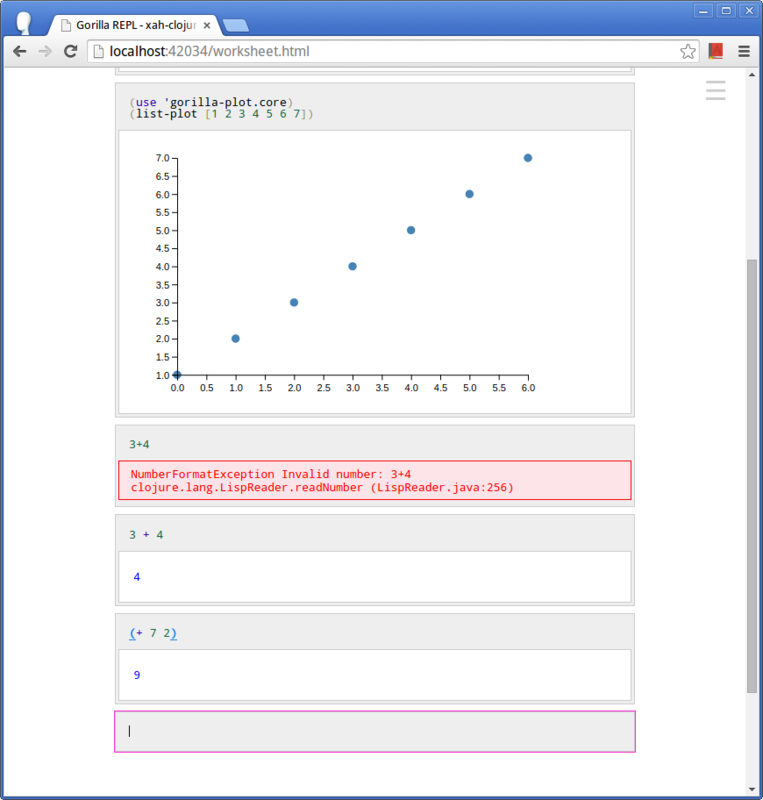 Note: gorilla-repl is basically a notebook interface to Clojure (similar to Mathematica). So, everything you type should still mostly be valid Clojure code. gorilla-repl does add some nice things. Try 3 + 4. Note: you need the spaces. You can edit and eval any cell. The following are for Linux and Microsoft Windows. For Mac, use Alt intead. 【Shift+Enter】 → eval current cell. 【Alt+Shift+Enter】 → eval all cells. 【Ctrl+Space】 or 【Alt+g Alt+a】 → show completion for current word. 【Alt+g Alt+c】 → lookup documentation of the symbol under cursor, in http://clojuredocs.org/ site. 【Alt+g Alt+x】 → delete current cell. 【Alt+g Alt+m】 → make current cell inactive as notes. You can type anything, such as title, instruction, explanations, description, notes etc. Markdown format is supported. 【Alt+g Alt+j】 → change current cell to active. 【Alt+g Alt+n】 → create a new cell below. 【Alt+g Alt+b】 → create a new cell above. 【Alt+g Alt+u】 → move current cell up. 【Alt+g Alt+d】 → move current cell down. 【Alt+g Alt+l】 → load worksheet. 【Alt+g Alt+s】 → save worksheet. 【Alt+g Alt+e】 → save worksheet with new filename. 【Alt+g Alt+g】 → show all keyboard shortcuts. (or Click on the menu icon on upper right corner). You can save a worksheet. 【Alt+g Alt+s】 → save current file to disk. It'll be saved at the directory gorilla-repl is started. 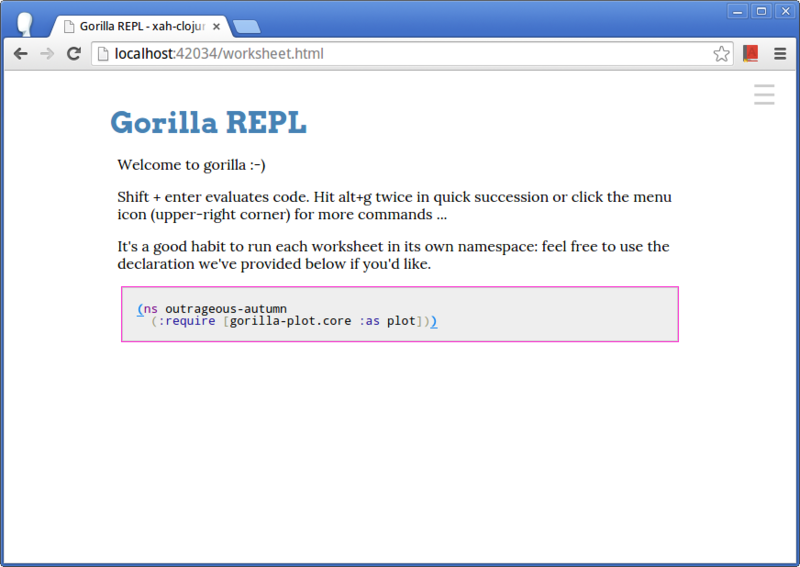 gorilla-repl worksheets are Clojure files with magic comments.